The Fatal Attraction is deadly on panfish and bass. 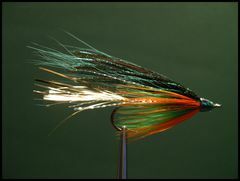 In size 8, it's also a great little trout streamer. Fatal Attractions, with their shiny Flashabou tails, are Dan Blanton's answer to spinners, with the flashy tail resembling a spinner blade. In preparation for an Alaskan fishing trip Dan, tied his first prototype on a size 8 hook to mimic salmon fry. He called it "The Natural." The "Natural" Fatal Attraction was deadly in Alaska and even more deadly in the algae stained waters of California's Lake Britton where he and his son caught over three-hundred Brown Trout in seven days. 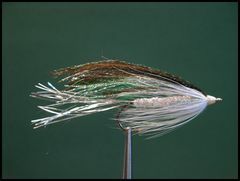 The "Natural" is tied with a silver or pearl Diamond Braid body, silver Flashabou for the tail, and white hackle for the the belly. All of the materials for the wing are the same as for the Baby Sunfish featured in the tying sequence to follow. The "Natural" makes a great baitfish imitation. 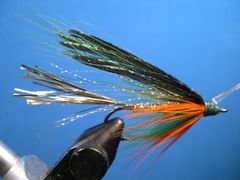 Another Fatal Attraction pattern, useful in off-color or low-light conditions, is tied with black bucktail replacing the green bucktail in the wing, pearl Diamond Braid for the body, and black hackle for the belly. 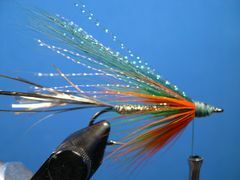 I tie Fatal Attractions on 4X long streamer hooks in all three color schemes - Natural, Baby Sunfish, and Black - in sizes 4, 6, and 8. 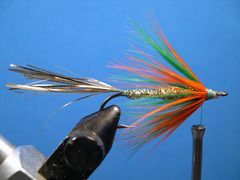 Tied in size 8, the tiny streamer is deadly on Bluegills and other panfish as well as trout. Size 6 for Crappies and Smallies and size 4 for Largemouth Bass are also good choices. I really think that eyes add a lot of fish appeal to streamers, so I always add 3-D plastic eyes to my size 4 Fatal Attractions. 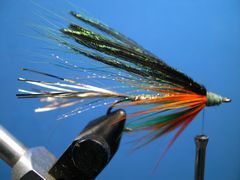 Fatal Attractions are fairly easy streamers to tie. After the tail, body, and belly are in place, the wing materials are added in four separate steps at the front of the fly. 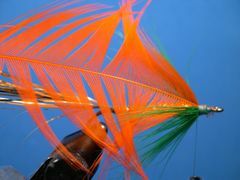 Make sure that you don't take too many thread wraps as you tie in each part of the wing or you will have an unmanageable fly head to deal with. Even though the Fatal Attraction is a weighted streamer, Dan Blanton likes to fish it in lakes with an intermediate to fast-sinking shooting taper fly line. 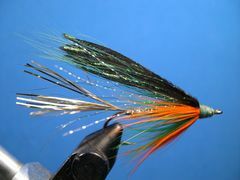 But the streamer is effective when presented on any type of fly line. If I'm fishing the fly shallow - two to five feet of water - I use a weight-forward floating fly line with a seven to nine foot tapered leader. If I want to fish deeper - six to eight feet of water - I use a five foot sink tip line with a four foot leader. 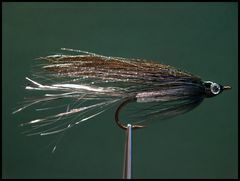 Count the fly down to fish level and strip it back with erratic six-inch to two-foot pulls followed with short pauses. You will feel the fish when it hits the fly. 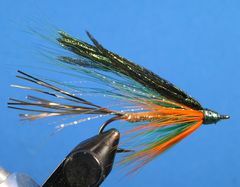 If you're fishing the fly in moving water, fish it like you would any other streamer. You can also fish it, in the smallest size, using a "Wet Fly Swing." Attach the thread at the front of the hook and cover the hook's shank with a base of thread back to the hook's bend. 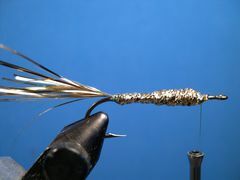 Leave plenty of room at the front of the hook to attach the hackle and the wing material. 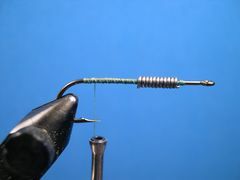 Select lead wire that is the same thickness as the hook's shank and wrap 10 to 12 wraps of wire on the shank. 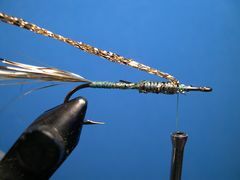 Tie in 20 to 30 strands of gold Flashabou just behind the lead wire and bind it along the shank to the bend of the hook. The tail should be as long as the hook's shank. Cover the thread wraps and the lead wire with a coat of Dave's Flexament. Attach gold Diamond Braid in front of the lead wire with the tying thread. 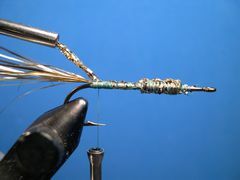 Bind down the Diamond Braid from the front of the hook back to the base of the Flashabou tail. Diamond Braid comes on a spool so it's a good idea to load the braid into a materials bobbin before you attach it to the hook. The braid is much easier to wrap on the hook's shank if it's wrapped with a bobbin. Return the tying thread to the front of the hook and wrap the Diamond Braid back to the front of the lead wire to form the body. Bind down the Diamond Braid in front of the lead wire. 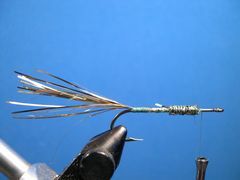 Select a wide and webby green hackle with barbs long enough to reach the hook's barb and prepare it as shown. You can use rooster saddle or neck hackle, as long as it's webby, but I prefer Whiting American Hen Neck hackle for the job. Tie in the green hackle by its tip with the cupped side facing the hook and make four or five wraps of hackle, one in front of the other. Don't overlap the wraps. Fold the barbs back and make wraps of thread over the front of the barbs back to the base of the lead wire to force them back, forming a deceiver - style collar. Remove any excess feather with the tips of your scissors. 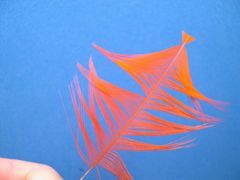 Now, prepare an orange feather the same way that you prepared the green feather. 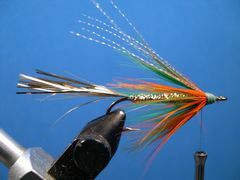 Tie in the orange feather by its tip at the base of the green feather with the cupped side facing the hook. 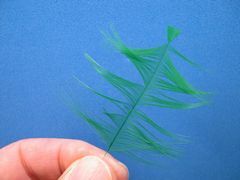 Handle the orange feather the same way that you handled the green feather in Step 8. Only this time take a wrap or two less of the orange feather. Remove the excess feather with the tips of your scissors. Now it's time to build the wing. For the first part of the wing, tie in 8 to 10 strands of pearl Krystal Flash that reaches to half the length of the tail. 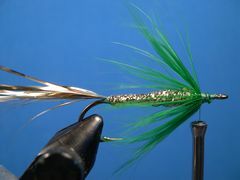 For the second part of the wing, tie in 20 or so dark green bucktail hairs. 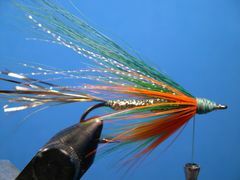 After the bucktail hairs are tied in they should be as long as the Krystal Flash. For the third part of the wing, tie in 8 to 10 strands of Peacock Krystal Flash. This part also extends back to half the length of the tail. For the fourth and final part of the wing, tie in ten Peacock Herls. They should be the same length as the other parts of the wing. Form a neat and tapered thread head. Tie off the thread with a couple half-hitches or a whip finish. Paint the head with head cement. I use Sally Hansen's Hard As Nails nail polish. It's the best head cement around. Your Fatal Attraction is Finished.